1000% over budget. 2 years late. We've all heard about projects where the original budget and schedule were exceeded by orders of magnitude. How could this happen given competent project management? Whether in government or private industry, project managers face a huge challenge when confronted with continually-changing requirements. How can you plan when the WBS keeps changing? Traditional project management approaches suggest that we take a snapshot of the requirements as a baseline, and then use change control in an attempt to minimize the impact of any shifting requirements. Sometimes, however, these changes are a reality that the project sponsor has to accommodate. The new Agile Project Management methods help deal with these situations. 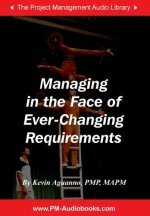 Listeners of this session will learn the founding principles and techniques of Agile Project Management with examples from real-world projects that used these methods to control changing requirements.